Even in the professing Christian religion of the Western world, we find different sects and denominations preaching a variety of different Gospels! Some designate their gospel as "The Gospel of Jesus Christ." Others call their gospel "The Gospel of Salvation." Still others profess "The Gospel of Grace," some "The Gospel of the Kingdom." And many now blossom out with a modern "Social Gospel," while others call their gospel "The ISRAEL Message." "But though we, or an angel from heaven, preach any other gospel unto you than that which we have preached unto you, let him be accursed." And it is made a double curse! For the next verse says: "... So say I now again, if any man preach any other gospel unto you than that ye have received, let him be accursed"! Jesus then said: He that BELIEVETH and is baptized shall be saved; but he that believeth not shall be damned" (Mark 16:16). Notice! Jesus said, He that BELIEVETH. Believeth what? Why, BELIEVETH that which they PREACHED, of course — THE GOSPEL! Not a gospel. Not any gospel. THE Gospel! On the authority of Jesus Christ, it is necessary to believe THAT PRECISE IDENTICAL GOSPEL in order to be saved! 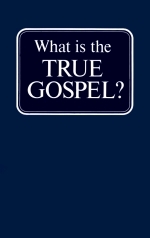 And to BELIEVE the true Gospel, we must first come to KNOW what it is! God the Father had promised to send a messenger into this world from heaven, bearing a message from HIM — God the FATHER! God had promised that in Malachi 3:1, "Behold, I will send my messenger, and he shall prepare the way before me [and that messenger, as explained in Mark 1:2, was John the Baptist, preparing the way before Jesus Christ]: and the LORD, whom ye seek, shall suddenly come to his temple, EVEN THE MESSENGER OF THE COVENANT, whom ye delight in. Notice carefully these points: 1) With whom did this Message — this Gospel — originate? Peter said: "The word which GOD sent." 2) To WHOM did God send it? Peter said: "unto the children of Israel." Although now, ten years later, this same Gospel was being opened up to Gentiles of ALL nations, originally it was sent to the CHILDREN OF ISRAEL, and it was sent by GOD THE FATHER. It did not originate with Jesus Christ, nor with Peter, nor with the Apostle Paul. It was sent by GOD the Father of Jesus Christ! 3) BY WHOM was it sent? Who was the divine Messenger who brought and preached the message? Peter said: "by Jesus Christ." Jesus Christ was the divine MESSENGER. Malachi called Him the Messenger of the COVENANT. That message, then, is the NEW Covenant Message; for Moses was the mediator of the Old Covenant, and Jesus Christ of the NEW, as affirmed by many scriptures. This message, then, is the NEW TESTAMENT Gospel. Now, 4) WHERE was it first preached? To what geographical location shall we look for its beginning? Peter said: It "began from Galilee." Yes, GALILEE, then, is the place where it was first preached. Not Jerusalem! Galilee! And what do we read? "Jesus came into Galilee, PREACHING THE GOSPEL OF THE KINGDOM OF GOD, and saying, The time is fulfilled, and the KINGDOM OF GOD is at hand: REPENT YE, and BELIEVE THE GOSPEL. Notice, Jesus said, "Believe THE GOSPEL!" The Gospel of Jesus Christ is NOT man's gospel ABOUT THE PERSON of Christ. It is CHRIST'S Gospel — the Gospel Jesus PREACHED — the Gospel God SENT by Him, and therefore it is also called, in Scripture, the Gospel of God. The Gospel of God is God's GOSPEL — His Message — His Good News which He sent by Jesus. We hear a great deal today of the gospel of MEN about the PERSON of Jesus Christ — confining the message solely to the things ABOUT Jesus. As a result, millions believe on Christ, who do not BELIEVE CHRIST! But Jesus' Gospel IS HIS MESSAGE! And yet it was not only His, but His FATHER'S who sent Him, as He Himself said. In John 12:49-50, Jesus said: "I have not spoken of myself; but the Father which sent me, HE gave me a commandment, what I should say, and what I should speak. And I know that HIS commandment is life everlasting: whatsoever I speak therefore, even as the Father said unto me, so I speak." The English word Gospel comes from the word "God-spell," and means GOOD NEWS. Daily, we read the NEWS of world happenings — mostly BAD news! We live in a troubled, chaotic world. And the very BEST news you can hear in this day, or any other, is the GOOD NEWS of the KINGDOM OF GOD. Four things are necessary to constitute a KINGDOM: 1) The TERRITORY, with its specific location and definite boundary lines, with 2) a KING or Supreme Ruler or governing agent, ruling over 3) SUBJECTS or citizens within that territorial jurisdiction, with 4) LAWS and form of GOVERNMENT. If we leave out any one of these vital requisites, we do not have, and cannot BELIEVE, the true GOSPEL for this time. We must know whether the Kingdom of God is here NOW, or coming later; whether its territory is THE EARTH, or up in heaven; whether it is a literal kingdom of human mortals, or a kingdom of immortals; whether it is literal or figurative, real or unreal. And on many of these things, a great many people are ALL MIXED UP! Notice, when Nicodemus came to Jesus secretly, as recorded in John the 3rd chapter, Jesus said to him: "Verily, verily, I say unto thee, Except a man be BORN AGAIN, he cannot see the KINGDOM OF GOD. Jesus was proclaiming the KINGDOM OF GOD — explaining a most important phase of it. As Paul wrote to the Church at Corinth in I Corinthians 15, flesh and blood — that is, a mortal human — cannot enter IN to the Kingdom of God. The Church, then, cannot be the Kingdom of God, for it is composed of flesh-and-blood mortals. The Kingdom is not, either, an ethereal something "set up in the hearts of men." Jesus went on to show Nicodemus that we who are born of flesh ARE flesh — just mortal flesh and blood. We were BORN that way — HUMAN — MORTAL. But it is possible for us to be BORN AGAIN — next time, not as a mortal flesh-and-blood baby, but born of the SPIRIT. Then we shall be spirit — composed of spirit! Now in the 4th chapter of John we read that GOD is a SPIRIT. The Kingdom of GOD is composed of those BORN of GOD. And as I have explained previously, GOD is not a single person, but the Hebrew word for God, Elohim, portrays God as a FAMILY of persons- -a single family, or kingdom, but composed of MORE than one person. We have the mineral kingdom — the plant kingdom — the animal kingdom. The Bible reveals an angel kingdom, created by God and composed of spirit, not matter. And then, high above all, is the very CREATING Kingdom — the GOD Kingdom, or, in other words, THE KINGDOM OF GOD! God is REPRODUCING HIMSELF! God created man in GOD'S IMAGE, so that man may become impregnated, BEGOTTEN, and, by a resurrection, be BORN as an immortal, SPIRIT-COMPOSED person in the KINGDOM OF GOD. Now, HOW do we enter into that glorious KINGDOM? Jesus came preaching the Gospel of the Kingdom of God, and saying, REPENT, and BELIEVE THE GOSPEL. Just TWO things we do — REPENT, and BELIEVE. We must BELIEVE the Gospel, and that means also believing on JESUS CHRIST, the KING of the Kingdom of God, and coming KING of kings over all the families of the earth. It means believing in Him as personal SAVIOUR, as High Priest now, and as coming KING. It means a total, complete CHANGE OF MIND AND OF LIFE. It means we REPENT of transgressing the rule, the will, the laws, of GOD. What did Jesus say to the young man who asked Him HOW to inherit eternal life? He said, "IF thou wilt enter into life, KEEP THE COMMANDMENTS" (Mat. 19:17). Luke 9: 1-2: "Then he called his twelve disciples together ... and he sent them to PREACH THE KINGDOM OF GOD." Luke 10:1, 2, 9: "After these things the Lord appointed other seventy also, and sent them two and two before his face into every city and place, whither he himself would come. Therefore said he unto them ... heal the sick that are therein, and say unto them, The KINGDOM OF GOD is come nigh unto you." In Jesus' prayer, so commonly called "The Lord's Prayer, He prayed, THY KINGDOM COME — then it wasn't here yet, and it isn't here yet, today — but He taught us to pray for it to COME, for His KINGDOM and that ALONE shall bring PEACE and HAPPINESS to this sin-sick, war-weary earth! "Thy Kingdom COME — THY WILL, BE DONE on earth, as it is in heaven. The FATHER'S WILL. Paul? Acts 20:25, 21: "I have gone preaching THE KINGDOM OF GOD ... testifying both to the Jews and also to the Greeks, repentance toward God, and FAITH toward our Lord Jesus Christ." And notice the Gospel Paul preached to GENTILES, after he had turned completely away from the Jews. And, WHAT GOSPEL did Jesus say should be preached TODAY? Matthew 24:14, speaking of the PRESENT: "And this GOSPEL OF THE KINGDOM shall be preached in ALL THE WORLD for a witness — for a WITNESS — unto ALL NATIONS; and then shall the END come"! — the end of this AGE. A single, all-powerful, WORLD-RULING GOVERNMENT is coming that will equalize all world problems fairly and righteously for ALL PEOPLES. Of course scientists say such a world-ruling government is impossible. Yet the Biblical revelation says it is NOT impossible — and that it is actually coming — and IN OUR TIME. It's about time that SOMEONE speaks out, in this world, and tells the world that the very GOSPEL of Jesus Christ was the advance ANNOUNCEMENT of this very world GOVERNMENT — a government, NOT by selfishly motivated man but by the living all-powerful God. Jesus Christ's message — His Gospel — was the Kingdom of God — the GOVERNMENT of the living God! Jesus Christ was BORN to be a KING (Luke 1:31-33). When Jesus was on trial for His life, Pilate said to Him: "Art thou a king then?" Jesus answered, "Thou sayest that I am a king. To this end was I born, and for this cause came I into the world ..." (John 18:37). Jesus had just told Pilate: "My kingdom is not of this world: if my kingdom were of this world, then would my servants fight, that I should not be delivered to the Jews: but now is my kingdom not from hence [that is, not of this age, but of the world tomorrow]" (John 18:36). Jesus is coming in supreme POWER and GLORY. Notice this description of the event: "Then shall appear the sign of the Son of man in heaven: and then shall all the tribes of the earth mourn, and they shall see the Son of man coming in the clouds of heaven with power and great glory" (Matthew 24:30). He is coming to set up the GOVERNMENT OF GOD and to rule all nations with the help of those who have qualified in this life. In Revelation 3:21 Christ is quoted as saying: "To him that overcometh will I grant to sit with me in my throne, even as I also overcame, and am set down with my Father in his throne." And again: "He that overcometh, and keepeth my works unto the end, to him will I give power over the nations: and he shall rule them with a rod of iron; as the vessels of a potter shall they be broken to shivers: even as I received of my Father" (Revelation 2:26-27). Jesus is the Messiah. Notice Isaiah's prophecy about the Messiah's coming government. "For a child is born unto us, a son is given unto us; and the government is upon his shoulder ... that the government may be increased and of peace there be no end, upon the throne of David, and upon his kingdom, to establish it, and to uphold it through justice and through righteousness from henceforth even for ever" (Isaiah 9:5-6, Jewish Publication Society). Micah predicted this time when he wrote: "In the last days it shall come to pass, that the mountain of the house of the Lord shall be established in the top of the mountains, and it shall be exalted above the hills; and people shall flow unto it. And many nations shall come, and say, Come, and let us go up to the mountain of the Lord, and to the house of the God of Jacob; and he will teach us of his ways, and we will walk in his paths: for the law shall go forth of Zion, and the word of the Lord from Jerusalem. And he shall judge among many people, and rebuke strong nations afar off; and they shall beat their swords into plowshares, and their spears into pruninghooks: nation shall not lift up a sword against nation, neither shall they learn war any more" (Micah 4:1-3). When the Messiah returns with all the power of God, we shall have WORLD PEACE, with happiness, joy, prosperity — and a CHANGED WORLD inheriting ETERNAL LIFE. That is the true Gospel proclaimed over The WORLD TOMORROW on the air worldwide — "IN ALL THE WORLD." Further information about the Kingdom of God is available in our free booklets: "Just What Do You Mean... Kingdom of God?" and "What Do You Mean... Salvation?"